If you love pub tours in Barcelona, you will love Christmas time in the city too. As an all-year-round destination, the city has everything you need for a romantic getaway in the winter. Pack your things and get ready for romantic moments underneath the Christmas lights! As a city with a true festive character, you will see that people adore decorations and know how to create an amazing atmosphere. The place is known mostly for its beaches and summer festivals, as well as Barcelona pub tours, but it can offer surprisingly great moments in the winter. Let’s see what you can do with your partner! Take a stroll underneath the Christmas lights. In Barcelona, around 100 kilometers of streets get covered every year with decorative lights called “Els Ilums de Nadal.” In fact, Christmas starts when these lights are switched on. For a special treat, go for the Montjuic Magic Fountain and see a special light show every evening in December. Just make sure to dress in layers, it might get cold! Christmas markets are also a big hit in Barcelona. The city has excellent shopping opportunities for the whole year, but this is just a seasonal specialty. Look for the Fira de Santa Llúcia Christmas market, where special shows take place and you will find the best offers and gifts for the season. Sweets, hot drinks and special decorations are mostly on sale here. It’s a good idea to stay after Christmas, since the 5-6th of January are special festive days in Barcelona. The Day of The Three Kings is a huge celebration with a carnival atmosphere that you shouldn’t miss. The festival commemorates the arrival of the three kings to the crib of the baby Jesus. See the carnival floats and try to catch some of the candies the children throw into the crowd! 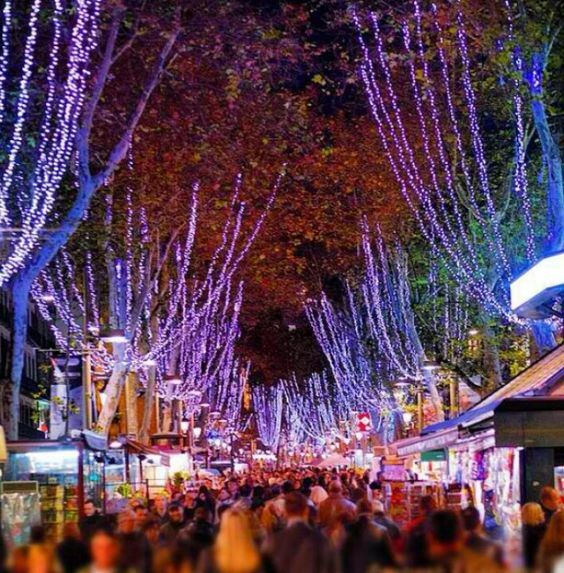 If you’re looking for a romantic getaway in Barcelona, you should time your visit for the winter as Christmas is a truly special time of the year in the city. Of course, don’t forget to discover the party atmosphere of one of Europe’s major party capitals. Sign up for a pub tour and have a blast with us!